Monkia, our expedition leader woke us up with her cheery “Good Morning, Good Morning Expeditioners” and an announcement that we would have a briefing on plans in the bar after breakfast. The weather continued to be foggy, but there was hope that the afternoon would present a weather window that would allow the medical evacuation to go ahead. There were not facilities on King George Island that would make it possible to offload the injured passenger and her husband to wait for the plane without us, understandably so the delay would cause further impacts to our planned itinerary. As a result we would do some of the things in the South Shetlands that were scheduled for the end of the trip at the beginning instead. The up side of that was that if we got to do a landing the thumb lady’s husband might get to do a landing before they were scooted off the ship. The downside was that some passengers were starting to get a bit grumbly. My own view on the subject was that if were me or one of my loved ones that needed to be getting off the ship I would want the crew to be doing exactly what they were doing, and anyway we were in the far south and everything that happened here would be at the whim of the weather. No point getting upset about it when everyone was doing everything they possibly could to make the best out of it. We had our first landing of the trip at Yankee Harbour, Greenwich Island. That meant our first trip out in the zodiacs. Everyone struggled into their numbered live preservers to be counted off the ship by the good doctor. As a group we were all a bit unruly as we seemed to be unable to form a single file for this purpose. We did improve for the subsequent landings though. I was a little apprehensive about the zodiac trip to shore. I had my camera in a dry bag inside my backpack and a rain cover on the backpack. The process for getting onto the zodiacs was clearly explained to us and the guides set off ahead to make sure everything was ok on land before we arrived. The Ushuaia is one of the smaller boats to come down to Antarctica, and even so it took 11 trips to get everyone ashore. It made sense that if you travel on the bigger ships you may only get on land once or twice in a cruise, and maybe not at all. I was very happy with our choice. 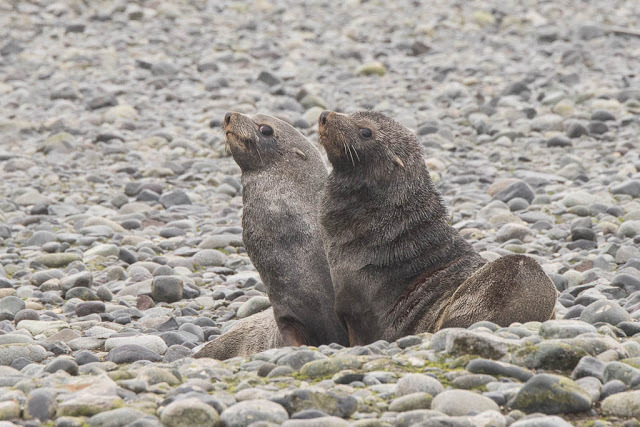 The sea lions (with ears) that live there now are no longer bothered by sealers, but a few of our fellow travelers failed to head the instructions of our guides and strayed too close for their comfort. The guides swung into action to distract the fast approaching and massive beasts and we avoided adding anyone else to the evacuation list. We visited our first penguin colony, this one Gentoo penguins. 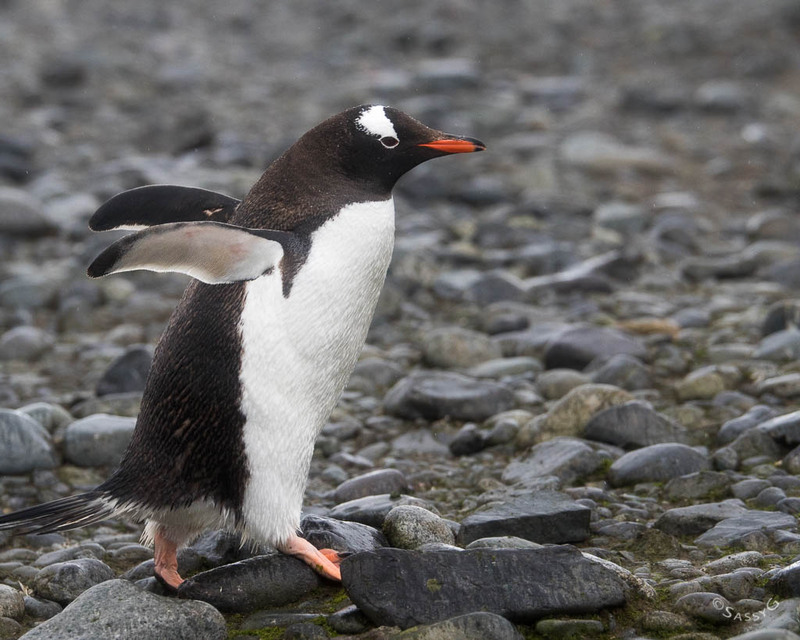 The Gentoo are the third largest penguin species, following after the emperor and the king penguins. 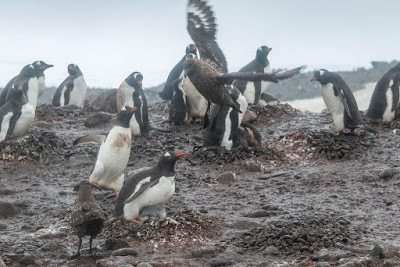 Gentoo also seem to be the most adaptable species, spreading themselves over much wider areas than others. They are less selective about diet so will eat krill, fish and squid based on availability. There were a couple of confused Chinstrap penguins in the group too. The different species don’t seem at all troubled by the intermingling. 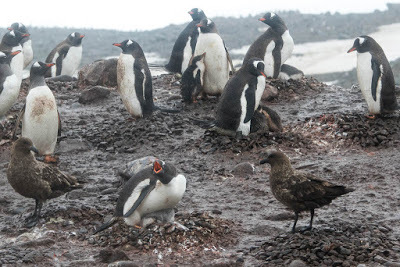 The Antarctic Skua needs a good PR company. 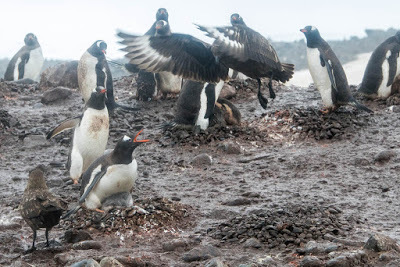 Being birds of prey in the antarctic means either you eat fish or you eat penguins. Putting a positive spin on eating cute little balls of fluff is tricky. . During our trip we saw a number of cute fluffy Skua chicks too, and we know that those chicks need to be fed but… Kelly took this harder than most. 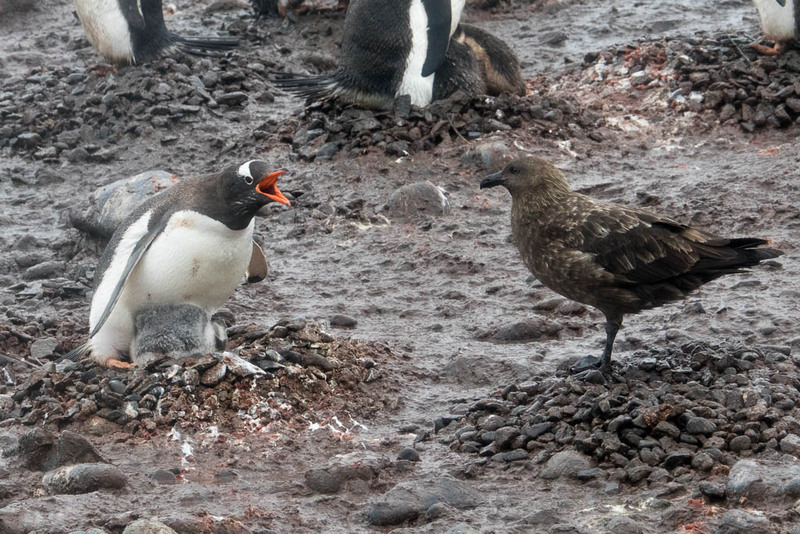 Knowing that everyone needs to eat doesn’t make it any easier to watch Skuas attempting to make off with a cute, fluffy, engaging little penguin baby. At this colony there were two penguins whose pebbly nests were a little further down slope than most. Enter two skuas keen on tag teaming penguin parents and their chicks. At one stage a penguin from the top of the slope came hustling down to help out one of the besieged parents. We don’t know what the outcome was, but we do now that some penguin parents will lose their chicks to predators, be they skua or leopard seals. 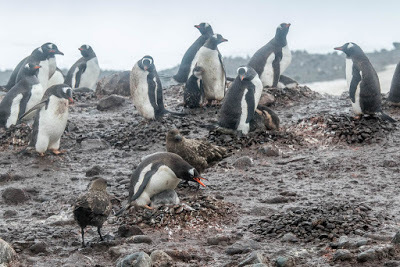 It’s a harsh environment I suppose, and I guess we didn’t spend anytime lamenting the baby squid that the penguins kill to feed their chicks. Just as well squid and krill aren’t cute and fluffy. 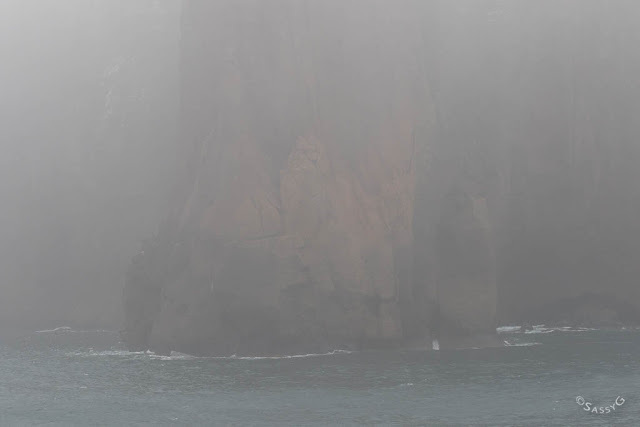 The whether hadn’t improved by the afternoon so our next activity was a boat tour of the stunning Deception Island. I will have to take the stunning part under advisement as we saw very little other than fog. It was interesting to be cruising around inside a volcano though. The last time it went up two research stations were lost. This is what Deception Island looked like to us. I wasn’t at all bothered by that. We’d seen penguins being adorably cute and that made my day. Although they look awkward, they navigate the most rocky terrain without hands and mostly without falling over, and can swim like Thorpey. I could not be more impressed. 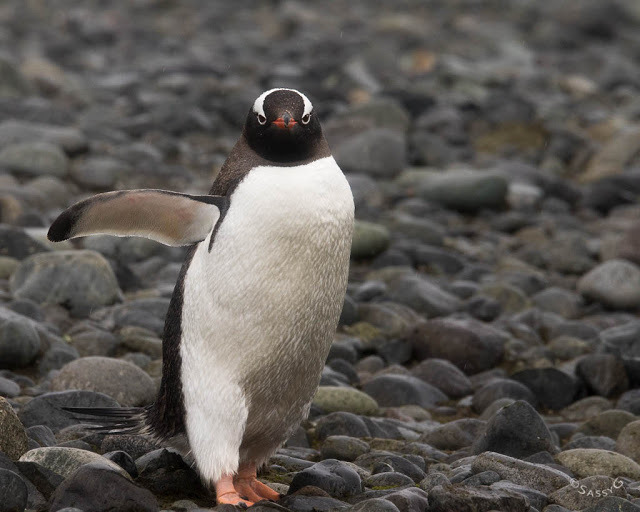 We also learned that although they look like they have short legs, most of their legs is hidden under their feathery bodies, sort of like reverse leg warmers. A grand day out regardless of a bit of rain and wind.